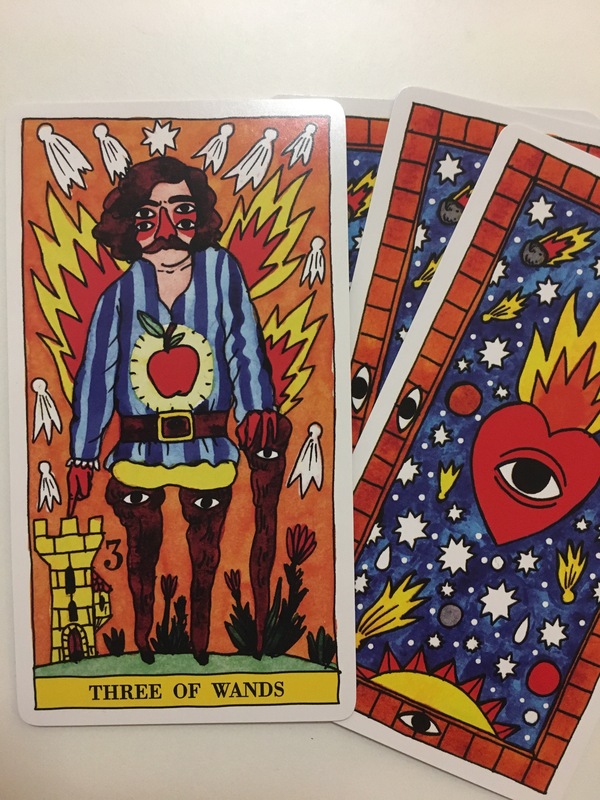 Card: Three of Wands – from the Tarot Del Fuego by Ricardo Cavolo. Message from the Faeries: The three wands depicted in this card are this person’s legs and support. Wands are the element of fire and represent your ability to create, and so this card is showing you that you have all of the creative foundational support that you could possibly need. As well, you carry the essential fruit of knowledge within you to excecute your creative ideas with precision, and the ghosts surrounding you represent fact that you have all the spirit (and spiritual support) required to get the job done. This week has all the potential of success. You have everything you need to achieve your goals, it is entirely up to you if you want to achieve what you desire. If you are experiencing any sort of trepidation, then it’s best to work that out before you get started. Go in with the mindset that you will be able to achieve success. A positive mindset will go a long way. Another thing that we would like to remind you of is that it would benefit you greatly, right now, if you were focus mostly on yourself and not so much others. That doesn’t mean that you shouldn’t have a care. If someone is need then please help to the best of your ability, but otherwise you should try to not pay too much attention to what other people are doing if it isn’t your business. Focusing on other people is an indication that you aren’t wanting to take a look at yourself and that you might be ignoring your own behaviour. If you aren’t paying attention then you will have difficulty in executing any projects this week. Don’t forget to have a care for yourself. This entry was posted in Faerie Reading and tagged creativity, faeries, foundation, Tarot, Tarot Reading, wands by faeriemessenger. Bookmark the permalink.